Containment Protocols: All instances of RPC-126 not marked for disposal are to be housed at Site-17 in a steel safe placed at the center of a standard containment cell fitted with mirrors affixed to all walls to aid in testing of instances. RPC-126 instances are to only be removed from their safe for testing purposes and are to be sealed back inside once all testing has been concluded. RPC-126 requires to be fed at least two average sized humans or one large farm animal per year for each instance, see incident log for details. All personnel are to avoid directly viewing instances of RPC-126 during testing and feeding times, unless through video surveillance, reflection, or through the video playback of a hand held camera. Description: RPC-126 consists of three instances hereby known as RPC-126-1, RPC-126-2, and RPC-126-3. 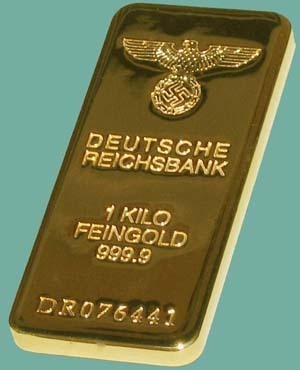 All three entities appear to be gold bars produced in Nazi Germany, commonly referred to as "Nazi Gold" and all three instances of RPC-126 are nearly identical to non-anomalous bars of gold of similar origin in both physical and chemical traits. RPC-126's anomalous traits manifest once an individual views an instance of RPC-126 with the naked eye, causing them to be filled with a strong desire to claim the instance for themselves. Once either a human or animal affected by RPC-126 touches an instance, the subject will refuse to release it, clutching it against their chest, in their arms, or in their mouths depending on the subject in question. Subjects will begin screaming at nearby personnel, threatening them with physical violence should they try to steal their "treasure". All other personnel can now gaze upon the instance of RPC-126 without suffering from the same mind warping effects as the subject holding the instance in their possession. At this time, the only effective method found in testing to remove RPC-126 from the subjects grasp has been physical force. Once the instance is separated from affected individuals, they must be isolated for a period of at least one week to recover from the withdrawal symptoms that will occur. During this time, subjects demand to be reunited with the RPC-126 instance under the pretense that they need it to survive. Listed below is a chart of the results found to be common throughout all tests with affected individuals. Once an instance of RPC-126 has grown to weigh approximately 2 kilograms, it will expel a golden coin in a similar fashion to cell reproduction through mitosis. The new instances, hereby referred to as RPC-126-A, bear the same insignia as the bars, but with the inscription "Gier Zeugt Gier" meaning "Greed Begets Greed." These new instances do not yet show the same anomalous properties as the original instances, but appear to have a growth cycle until reaching what can be considered a mature state where their cognitohazrdous effect finally manifests. All RPC-126-A instances are to be destroyed unless deemed necessary for testing or observation purposes. Destruction of instances at any stage of growth via blast furnace has proven effective at removing the instance's anomalous effects.